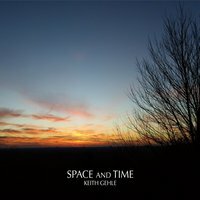 Keith Gehle is a guitarist and composer whose album Space and Time features both acoustic instruments and synthesized elements. Comprised of eleven tracks spanning thirty-eight minutes, the album was mastered by Tom Eaton for Imaginary Road Studios, while all compositions and arrangements were performed by Keith Gehle. Acoustic guitar is the album’s lead instrument throughout, which is intricately woven into the silky fabric of a musical ensemble that variably consists of piano, flute, strings and synths. The opening piece, “Waiting for the Sun”, signals an approaching dawn, where acoustic guitar is accentuated by hazy tones and textures that lend an overall warm yet spacious effect to the composition. Continuing in this motif is “Lavender Sky”, which opens with beautifully cascading guitar accompanied by piano and synthesizer. Breezy touches of flute further compliment the piece, adding to its distinct seasonal feel, as one can easily imagine delicate autumn leaves dancing in the wind of an early dawn. “The Escaping Light” is a notable piece that opens with solemn strings that are followed by a more melancholic guitar melody, as ever-so-subtle piano and flute provide an added touch of tenderness throughout. One especially intriguing piece is “Tone Poem No. 6 (Space and Time)”, which displays a wonderful interplay of guitar and piano. As if one instrument represents space and the other represents time, the guitar follows the piano lead like that of a dancing couple, while they become increasingly surrounded by sparkling textures and suspended strings. “Cooper’s Creek” is another particular highlight that begins with the gentle sounds of flowing water. It is soon followed by a notably warm and earthy guitar melody, making for a composition that feels intimately connected to nature while nestled somewhere between evening and dawn. Perhaps saving the best for last, “Tone Poem No. 2 (Stars of the Desert Sky)” makes for a perfect conclusion and is easily my favorite piece on the album. Here, a hazily atmospheric ensemble of instruments alludes to a starlit sky, which is conveyed by an ethereal enmeshment of flute, strings and a slightly poignant guitar melody. For more information please visit the artist's website. This album is also available at Amazon and CD Baby.